← Introducing Galco’s WalkAbout 2.0! (Greeley, PA) – Kahr Firearms Group, a leader in innovative firearms design and manufacturing, is proud to announce its sponsorship of the NRA Tactical Police Competitions on November 2-3 in Fairfax, VA. The Tactical Police Competition (TPC) is a program designed to challenge officers through courses of competition that focus on skills with duty firearms and gear. The TPC is only open to law enforcement and military and utilizes only patrol duty firearms and equipment. The program gives officers an opportunity to practice and sharpen skills in handling and deploying their duty firearm, as well as solving hypothetical challenges through scenario-based training courses. TPC matches include 4 to 7 courses which utilize a pistol, rifle or shotgun, or a combination. The courses challenge officers to sharpen and evaluate their skills with their duty weapon as well as their ability to make tactical decisions and assess threats and environment. 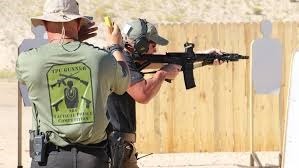 TPC matches are live-fire training competitions and give valuable opportunities and experience to participants. The TPC program holds matches around the country. For more information and to see a schedule of events, visit NRA.org. This entry was posted in competitions and tagged Kahr, NRA, police, tactical. Bookmark the permalink.